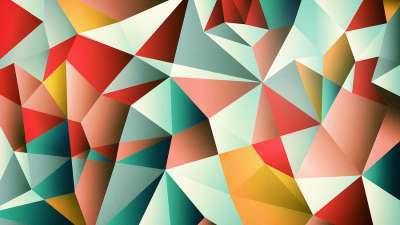 Why do all the biggest brands create mountains of content? Since Google changed it’s algorithm, content has become the new SEO, generating lots of qualified traffic. But there’s another reason. The better you are at creating value with your content, the more conversions you can drive as well. The challenge is to know what your audience perceives as valuable and how you can create it for your own brand. Fortunately, there’s a tool for that. If you’re looking for a good way to create high-converting content, you need to seriously consider BuzzSumo. The Web application claims to let you analyze the best-performing content for any niche. Let’s have a look at how it works and how this can impact your own content strategy. Finding a topic that interests your audience is your first step in creating content that converts and, as you can see, BuzzSumo can help. To optimize your own content plan, compare popular topics to your core topics. Is there a connection? Or can you make a connection? Can you create some newsjacking pieces? Or simply ride a trend, creating a series of articles that let you join the conversation? A BuzzSumo topic search usually returns content in different categories (currently articles, infographics, guest posts, giveaways, interviews and videos) within the past year. For each piece of content, you can see the domain, author, publication date and article type. Other columns show shares on the main social networks (Twitter, Facebook, LinkedIn and Google+ and Pinterest), as well as total shares. You can sort by any column and can also change the date range to six months, a month, a week or (if you want to find really hot content) 24 hours. You can easily find out what type of content gets the most shares, and this can guide your own content creation efforts. In my test, the top types of content were articles, infographics and videos. Use the filtering tools in the left column to tweak the display till you get meaningful data for your own content strategy. Then apply this information to your content planning. Are you creating the types of content that are most likely to get shares? And are you creating titles that are clickable? It’s important that you pack your content with so much value that people want to share. Another way to get better conversions is to share your content in the right place. BuzzSumo helps you to identify what does best on which platform, thanks to the ability to sort by the social site column headers. Simply click on the social channel you want to review, and you’ll see which content is most popular in that channel. How can this help you optimize your content strategy? 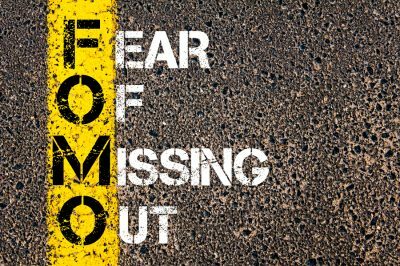 Check for possible conversion optimization failures such as lack of relevance to your audience, poor web or mobile user experience or too many social sharing buttons. 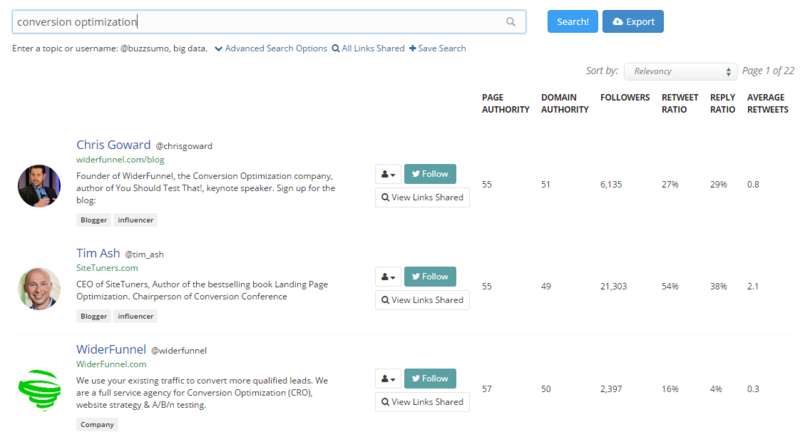 A recent addition to the BuzzSumo feature list is the ability to see who has linked to a particular piece of content and what content has been shared from particular sites. You not only see who shared your content, but their authority, the shares they generated, and more. Don’t forget to use the sorting features to see whose shares are getting the most reshares. Evaluate that content, and you’ll know what content you should be creating to ensure even better reach for your brand. How do you use this information to optimize your own strategy? Check to see if there are any common features among the content being shared and linked to by influencers. That gives you a head start in creating new content they are likely to share. In this search, how-to articles and titles with numbers did very well, which matches some of the advice on writing great headlines. In addition to reviewing content on a particular topic, you can also generate a list of influencers for that topic. 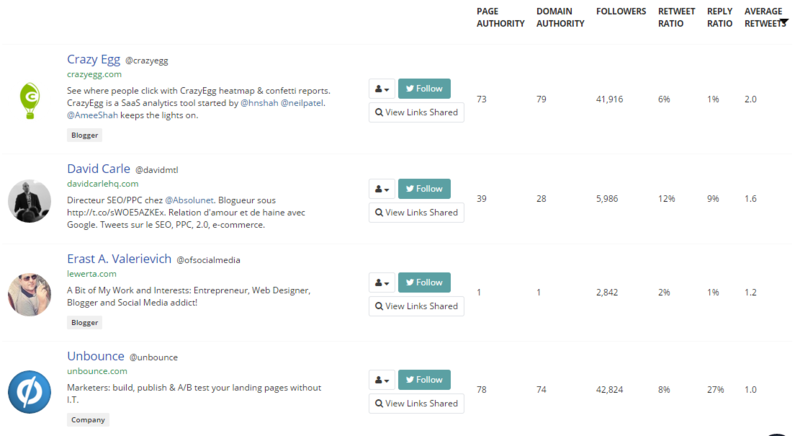 A BuzzSumo search for any topic gives you the top 10 influencers sharing links on that topic. You can click an additional link to see what they have actually shared. If you narrow down the date periods, you can get a pretty good idea of what interests them now and can tailor your content marketing strategy to suit. The screenshot here shows some of what the top influencers in conversion optimization have shared during the past 6 months. Don’t stop there. You can use that same function to find and follow influential people in social media so you can connect with them and build genuine relationships (after all, you are interested in the same things). Have conversations with them (hey, it works on Google+) and share their stuff. Taking time to get this step right will increase your chances of having them share your top-quality content when you publish it. More shares lead to more attention, more leads and more conversions. Authority and trust equals conversions, says Jessica Lee. And one great way to build authority is with guest blogging. Since BuzzSumo has a filter for guest posts, use this to identify sites that accept guest posts. As a bonus, you can easily do another search to find out what content is most popular on each of those sites. Then you can create content that the sites want AND get it widely shared. That’s a double win for your authority-building efforts. Promote your content after it has been published. It even suggests the best days for publishing content to get social shares (Monday and Tuesday). You can follow all the tips listed above with the free version of BuzzSumo, but there’s even more in the Pro version. That gives you content alerts for key topics so you can immediately know when there’s something you want to respond to. 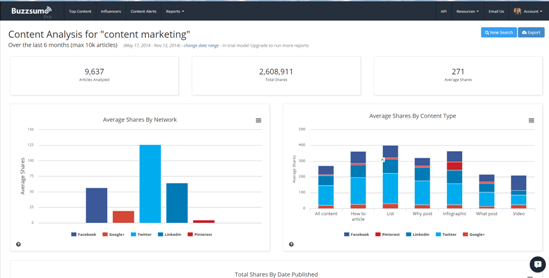 You can also do in-depth analysis of shares for different social networks. 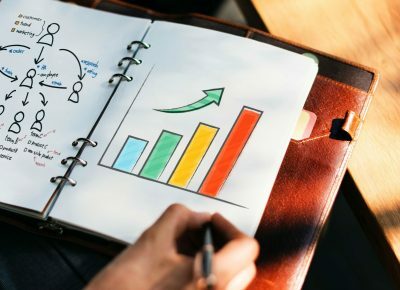 For example, the sample analysis above compared more than 9000 articles on content marketing and showed more than 2 million shares in the category, with Twitter dominating sharing activity. It also showed that list posts were by far the most popular type of post for this topic. You can even compare content by domain. With viral content analysis, an overview of widely shared content and access to influencers, BuzzSumo is a great way enhance the success of your content and help you achieve better conversions. It can help with content curation too. Which is why I heartily recommend it. Are you using this useful tool? If so, what’s your favorite feature? If not, what are you doing to optimize your content?